6°C, gales from SE. Some dry patches too. 3DS Max 8: I don’t often find the time to play with 3D software, but here is a still from a longer render that I ran overnight. As I write, I am attempting to upload the clip to YouTube. Visualisation of a pulsar using 3D animation software. Inspired by the book- Clocks in the Sky: The Story of Pulsars by Geoff McNamara. To make the job easier, this pulsar spins at only 2 times per second. There is a particle system for each pole and a volumetric light. If I have the right idea, then there is a gas jet from each magnetic pole and an electromagnetic beam too. With a rapidly spinning source, those two would not be colinear some distance from the object. The particle system doesn’t show clearly; a feature that needs some work. Also, an introductory distance shot would work well. 3D animation takes a long time and only produces a few seconds of video each day. Some shots can be re-used, stills can be overlaid in the video editor. 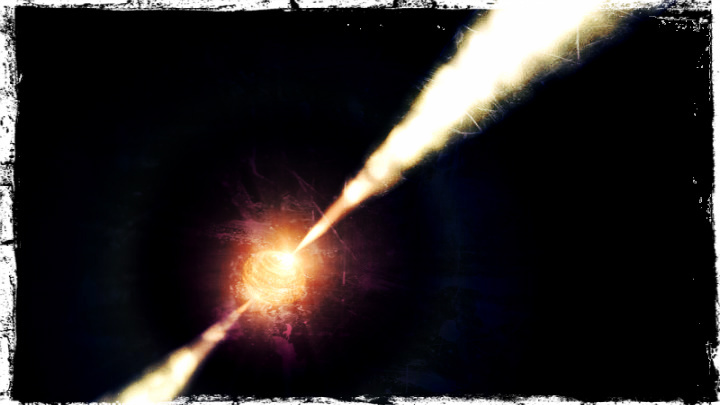 This entry was posted in 3D animation and tagged 3DS max, Astronomy, neutron star, pulsar, Simulation. Bookmark the permalink.